The Queenslander house is a classic piece of Australian architectural design. With its distinctive timber and corrugated iron appearance, it breaks the monotony of the bland, master-planned display villages on the peripheries of our cities. It’s also a great example of “vernacular architecture”, a term first coined by American writer/ architect Bernard Rudofsky in his 1964 book Architecture Without Architects . Vernacular architecture is best described as a traditional or indigenous type of architecture, one that has evolved over time in response to local climatic, environmental, building resources and cultural human needs. It is reflective of a very specific local context and is a functional and practical design response. In Queensland, timber and iron vernacular houses emerged in the mid-19th century as a response by European migrants to the new subtropical climate. Wide verandas provided relief from the lengthy, hot summer days, punctuated by heavy afternoon downpours of rain. John Freeland , a former professor of architecture at UNSW describes the Queenslander as: the closest Australia ever came to producing an indigenous style. What makes the Queenslander so distinctive? The classic Queenslander is typically a single detached house made of timber and iron, and located on a separate block of land. The floor plan consists of four or six rooms, which branch off a centrally located corridor, and which are adorned by external shading verandas. Queenslanders are ideally located on the peaks of hills, which allow for both views and cooling ventilation. They are purposefully designed at a human scale and to provide a sense of place in the Queensland context. 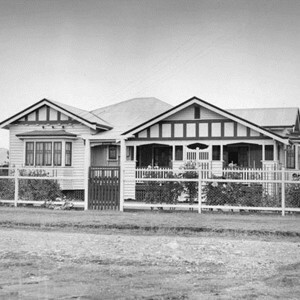 British colonial traditions previously developed in India and elsewhere influenced the adoption of extensive deep shading external verandas on two, three or four sides of the typical Queenslander. These protected spaces provide a refuge from Queensland’s extreme summer sun and rain deluges, while also functioning as clever breeze scoops to direct cooling natural ventilation through the house. The veranda provides a unique multi-purpose space, which is neither indoors nor outdoors. Often used as an extension of the indoor living space, verandas have also been adapted to act as sleep-out areas, or protected areas to hang the laundry. The wrapping of the house in verandas encourages the house to face outwards, rather than the inward-facing design approach of houses more appropriately situated in cooler climates. Steeply pitched corrugated iron roofs are lightweight, durable and fire-resistant, and allow for high cooling ceilings below. Double hung windows and doors typically open to outside verandas, and line up internally. Generally left open in summer, with the assistance of the flanking veranda breeze scoops, they encourage cooling breezes into the house and move the hot humid air of the interior spaces out. Movement of air through the house not only provides a welcoming cooling relief, but it also serves as a necessary protection against interior mould growth, which is synonymous with a humid climate. Facades without verandas typically have limited roof overhangs. On these facades, timber and sheet metal window hoods with perforated decorative side fins provide shading and divert rain, all the while releasing trapped rising hot air, thus helping to further cool the inside of the house. The Queenslander “touches the earth lightly”. The light timber-framed structure is elevated above ground on stumps, which allows it to be placed on a variable terrain; from the hilly areas in South East Queensland, through to the wetter earth in the more northern Tropics. There are a number of advantages to this approach. In addition to merely allowing a flat floor to be built on a sloping site with minimal ground excavation. Raising the house allows high level prevailing breezes to be captured inside, and ventilation or a cool pool of air beneath the floor, helps to cool it from below. It also provides the timber with protection from white ants. Their light timber frames and corrugated iron materials make Queenslanders simple to modify and adapt to the changing needs of the occupants. They can be raised or simply transported to another site on the back of a truck. Surely recycling a house is the ultimate sustainable design solution? Unique decorative features on the Queenslander are not only aesthetically pleasing, but also functional. These include cast iron or timber balustrades, gables and column brackets, and timber screens, louvres, fretwork and battens. Battened screening and coloured glass provides privacy for occupants, while simultaneously directing breeze movement and/or reducing solar radiation. A return to the Vernacular? Modern Australian architecture turned its back on the vernacular in the name of “progress”. The outskirts of each of Australia’s capital cities are now adorned with developer-driven display villages, where prospective homeowners can select a house and land package, and indulge in the great Australian dream of home ownership. These homes largely do not address the local context or climate, and are driven by a desire to maximise the ratio of the footprint of the building to its site, while keeping initial building costs to a minimum. But with recent concerns about high-energy consumption and costs, architects and planners are once again embracing the importance of energy-efficient sustainable design and selection of local building materials. While technology enables us to source affordable building materials globally, architects are now taking embodied energy, lost through transporting these materials to the building site, into account. Not only is there a concern about initial building costs, but whole life-cycle costs are now also on the radar and efficient climate responsive designs are valued. For those of us living in the sub-tropical or tropical contexts of Queensland, this means a return to and perhaps a reinterpretation of, the essential and architectural traditions of the classic Queenslander, whose design can be easily modified to suit our contemporary lifestyles.